Are you already a Rotarian? Take a look at the 4 Way Test of the things we Think, Say or Do. 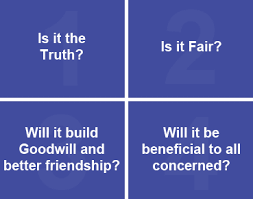 If those things resonate with you, you may ALREADY be a Rotarian and not know it! And should you decide you would like to become a badge wearing Rotarian, you will find yourself in great company. Presidents, Prime Ministers, Poets, Scientists, Nobel Peace Prize Laureates, Popes, Actors, Composers, Bakers, Store Owners, Teachers, Mothers, Librarians, Pharmacists, Accountants, Marketers, Salespeople, Engineers, Baristas ... in short, your friends and neighbors, people from all walks of life find reason and direction in the multiple and diverse directions of Rotary Clubs. We would love to welcome you to our Club any Tuesday evening at 6pm at Freda's Seafood Grille at 10903 Pecan Boulevard in Austin, Texas. Reach us on Facebook or email to confirm that the day you have chosen isn't one of those days we're off doing a special project somewhere.